Oregon consistently ranks among the top ten worst states in the nation for outright hunger, but each year, Oregonians throw away 150 lbs of food per person. In the Portland area, close to 200,000 tons of food ends up in landfills, further contributing to greenhouse gases. This wasted food is a lost opportunity to impact hunger in our community. B-Line is committed to making our communities more livable - whether by reducing congestion and CO2 emissions in our cities, or doing our share to help those in need. With your help, B-Line can make deliveries that make a difference in our community. How can the B-share program help? Transportation of surplus food is one of the biggest challenges the food assistance network faces in sourcing food donations. 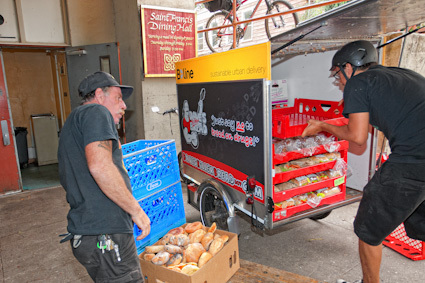 As a transportation company making seven or more round-trip delivery routes in downtown Portland daily, B-Line can leverage its existing business model and deliver food donations at a greatly reduced cost--50% or less than the costs typically incurred. Learn more about the cost benefits of the B-share program here. With great partners like Whole Foods Market, New Seasons Market, Dave's Killer Bread, R & K Foods, and the People's Coop Farmer's Market providing high-quality, fresh, and healthy food donations, B-Line can quickly and efficiently deliver it directly to our nonprofit partners in the urban core who are providing food assistance: Sisters Of The Road, Portland Rescue Mission, Blanchet House, pear, and St. Francis Dining Hall. Learn more about food insecurity and hunger in Oregon at the Oregon Food Bank's website: www.oregonfoodbank.org.